Recently, the N.Y. Times bestselling Christian book, the Harbinger, became the focus of several critical reviews. Fortunately the author, Jonathan Cahn, took these concerns to heart and responded to them in a widely heard radio interview hosted by Jan Markell of Olive Tree Ministries, and Understanding the Times radio. 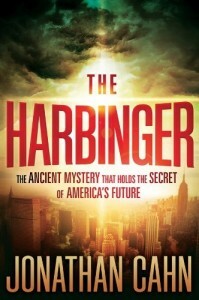 Prophecy Update Radio interviewed Jonathan Cahn on our program when his book first came out, and this timely interview can be heard by clicking the following link The Harbinger. From my perspective I would like to inform our Prophecy Depot Ministries friends that I have become a friend of Jonathan Cahn’s and support his Harbinger message to America. In fact, I spoke in front of his congregation in early June, 2012. Moreover, I recently shared a speaking platform with Jonathan Cahn, Chuck Missler, Gary Stearman, Joseph Farah, and several other respected Bible teachers at the “Prophecy Summit – Branson 2012.” I personally was richly blessed by Jonathan’s teaching at the conference. It was one of the best presentations I have heard at a prophecy conference. During his message Jonathan took the time to answer his critics in love, wisdom, and tasteful humor, before proceeding with his powerful message of warning for America. Jonathan concluded with a sincere gut-check call to Christians in attendance to become the salt and light of the earth as the Bible instructs us. In his unique anointed style, Jonathan led the group in a prayer of repentance. Promptly afterward I spoke with World Net Daily founder Joseph Farah outside in the hall and we both agreed that those presently criticizing Jonathan Cahn and his Harbinger book would likely have had a change of heart had they been in attendance. As Jonathan’s friend I want to invite you to listen to his interview with Jan Markell. Their important program can be heard by clicking the following links for part one of Understanding the Times with Jonathan Cahn, and part two of Understanding the Times with Jonathan Cahn. His message from the Branson conference will soon be made available at Prophecy In The News. Below is the text that applies to Jonathan’s interviews taken directly from Jan Markell’s website. PART ONE TEXT – Jan’s guest is Jonathan Cahn who answers some of the questions his critics are hurling. Cahn states that it was his intent to write a message emphasizing repentance, salvation, and the restoration of America to God’s grace. He states no ministry leader has reached out to him before the accusations began, nor have most read the book “The Harbinger” or viewed the DVD, “The Isaiah 9:10 Judgment”. Joseph Farah also weighs in as producer of the film. Cahn feels information is being twisted and distorted with extensive guilt by association. Jan and her radio team spend 1 hour 40 minutes asking him questions that are flying around the Internet. Just a small sampling of the issues include his connection to the New Apostolic Reformation, Sid Roth, Glenn Beck, the Jewish Kabalah and Zohar, his eschatology, his belief about Dominionism, Replacement Theology, his publisher, and much, much more. In spite of this, the book and DVD sales are only soaring. Cahn’s concern is, nonetheless, that some could be turned away from the story and thus not come to repentance and salvation. We sell the DVD at the following link “The Isaiah 9:10 Judgment”. Because one radio person suggested Cahn is a false prophet and in the Bible they were stoned, Cahn’s wife now fears for the safety of her husband and two very small children. Is this where the apologetics and discernment community want to go? Jan has co-hosts participating. They can be reached at www.waltermartin.com and www.ericbarger.com Cahn can be reached at www.theharbinger-jonathancahn.com We go an extra 40 minutes in the questioning in the Web bonus which can be accessed below. PART TWO TEXT (the web bonus) – Jan and her co-hosts Eric Barger, Jill Martin Rische, and Larry Kutzler continue questioning Jonathan Cahn on important issues and accusations flying around the Internet and on radio. Another 40 minutes are taken to clarify some of what seems to be confusing to some. The radio team also asks why not one critic would reach out and contact Cahn before the criticisms and accusations began? Cahn made many attempts to reach those accusing him of many false theologies and associations. In most instances — although not all — the accusers would not even respond to his calls or emails. Whether one appreciates “The Harbinger” or not, this ministry is asking if the manner in which a near lynching has been going on is Christ-like and in the manner suggested in the Bible as it concerns contending for the faith? When Cahn is accused of occultic involvement when he teaches against it, has the discernment community pushed too far? Are they then just shrill accusers of the brethren? We recommend you get the DVD, “The Isaiah 9:10 Judgment” and decide for yourself.